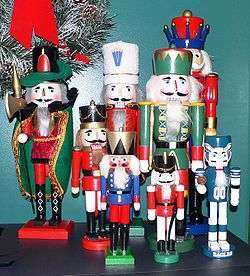 Nutcracker dolls, also known as Christmas nutcrackers, are nutcrackers figurines most commonly made to resemble a toy soldier. In the German tradition, the dolls are symbols of good luck, their teeth scaring away bad spirits. The origin of nutcracker dolls is the late 17th century Germany, particularly the Ore Mountains (German: Erzgebirge) region. area. One origin story attributes the creation of the first nutcracker doll to a craftsman from Seiffen. They were often bought and given as gifts, and at some point they became associated with Christmas season, and particularly in the United States are seen as a Christmas decoration. They grew in popularity around 19th century, and spread to nearby European countries. As the demand grew, nutcracker doll production also begun on the mass scale in factories. Wilhelm Fuchtner, known as "father of the nutcracker", begun the first mass production of the design (using a lathe) in 1872. They were popularized by Pyotr Ilyich Tchaikovsky adaptation of the The Nutcracker and the Mouse King play, which featured a character that is the toy soldier nutcracker. The play was a hit in the United States, where it popularized the nutcracker dolls, almost a century after they became a regional hit in Europe. An average handcrafted doll is made out of about 60 separate pieces. The nutcracker dolls traditionally resemble toy soldiers, and are often painted in bright colors. Different designs proliferated early, by the early 19th century there were ones dressed as miners, policemen, royalty or soldiers from different armies. More recent variations have been made to resemble various pop-culture or historical figurines, from Benjamin Franklin to Desert Wars-uniform American soldiers. While nearly all nutcrackers until first half of the 20th century are functional, significant proportion of the modern decorative nutcrackers are primarily decorative, and not able to crack nuts. Wikimedia Commons has media related to Nutcracker dolls. 1 2 3 4 5 6 7 8 9 Malone, Noreen (2010-12-16). "In a Nutshell". Slate. ISSN 1091-2339. Retrieved 2016-07-22. 1 2 3 4 5 Ballet, The Australian. "The nutcracker doll: a history | The Australian Ballet". australianballet.com.au. Retrieved 2016-07-24. ↑ "NM The History of Nutcrackers ~ Leavenworth Nutcracker Museum". www.nutcrackermuseum.com. Retrieved 2016-07-24. ↑ Maureen Stanton (9 June 2011). Killer Stuff and Tons of Money: An Insider's Look at the World of Flea Markets, Antiques, and Collecting. Penguin Publishing Group. p. 25. ISBN 978-1-101-51605-8. ↑ "Why Fancy Nutcrackers Don't Actually Crack Nuts | The Plate". 2014-12-08. Retrieved 2016-07-24.